In our best pillows for neck pain reviews 2019 we shall present you with 10 of the best cervical pillows we have been able to source. There are many causes for neck pain, and the more common of these will be discussed shortly. Our best 10 have been chosen for their ergonomic cervical support properties. Most people purchase their pillows for their comfort properties. They pay little attention to ergonomics. One of the best ways to avoid neck pain is to sleep with your neck in a straight line with your head and back when viewed from the front or the back. However, when viewed from the side, your neck has a bend that your pillow should be able to maintain. More on this later. For now, here are our top 10 pillows for neck pain, otherwise known as cervical pillows. Most of these pillows are not of regular size (Queen, King, etc.). The dimensions stated are average, or for the king size where appropriate. Other sizes are available as stated in the individual reviews. We have not generally stated any thickness measurement other than where relevant. An 8″ thick soft mattress can offer less support than 5″ firm mattress! 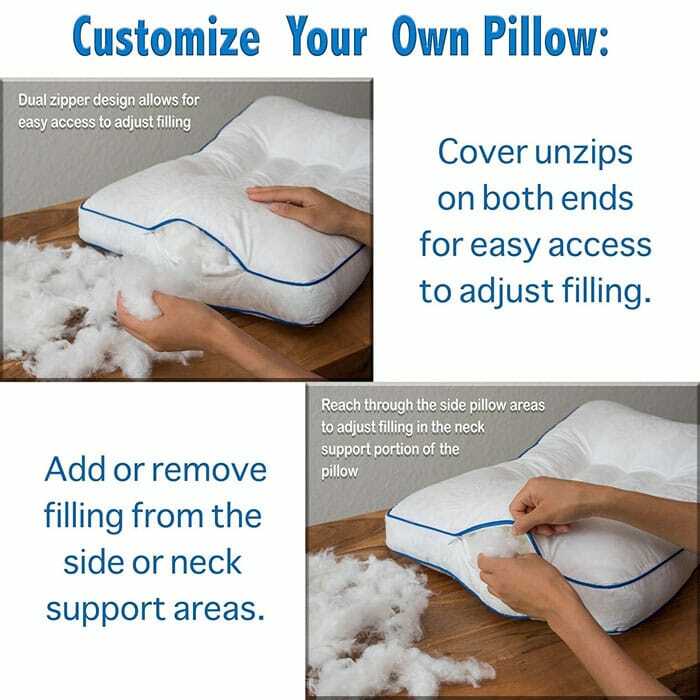 * The memory foam is shredded to enable you to remove some filling through the zippered cover, or pack more in to reduce or increase the hardness and support of the pillow to meet your needs. 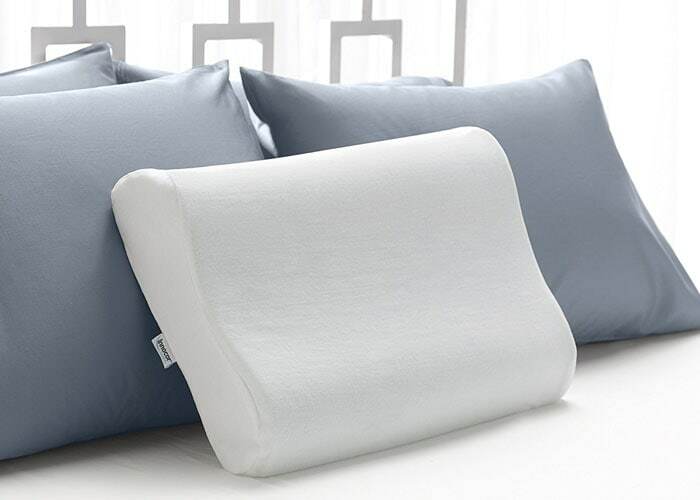 The Coop Home Goods Premium pillow is a high-quality cervical pillow that supports your head and neck to enable them to remain in a natural position while you sleep. It prevents pressure being applied to your cervical vertebrae to the extent that their natural orientation is compromised. It has been manufactured using what is known as ‘shredded memory foam’ technology. You can read more about this later in this review. While you are using it, the Coop Home Goods Premium pillow offers good support. It also enables you to change its feel by thinning it out or fluffing it up. You can simulate the breathability and lushness of a good down pillow, while also providing the plushness of a high-quality down pillow. You may also reproduce the support that memory foam offers. You will read about cervical kyphosis in our Buyer’s Guide later. 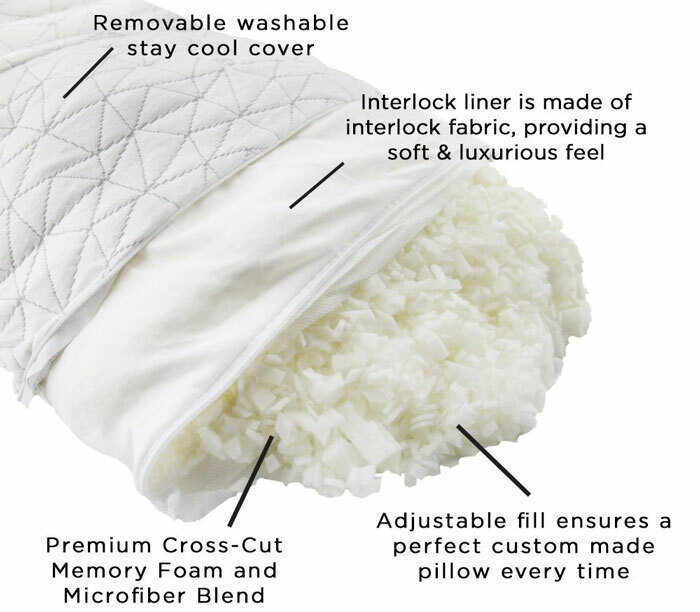 Here are some of the more salient features of the Coop Home Goods Premium pillow. The Ultra Soft Proprietary Bamboo Polyester Blend Fabric helps you to feel cool in bed. It consists of 60% polyester and 40% bamboo-derived rayon. Coop Home Goods Premium Pillow is designed to keep your neck in the correct position while sleeping. The shredded memory foam allows a good flow air through the mattress, with a correspondingly high level of consistency. The shredded memory foam is far superior to a solid memory foam mattress. The foam used ensures that the pillows are correctly manufactured, resistant to dust mites and provides excellent air flow while you are sleeping. Dust mite resistant and hypoallergenic. 100-Day trial period – return within 100 days for no-questions refund. This pillow can be a little on the hard side for some, particularly side sleepers. However, you can fluff it up or remove some of the filling. Editor’s Notes: This is our top choice because the high level of air flow through this orthopedic pillow helps to keep you cool at night. Shredded foam has a lot more air in it than solid memory foam. 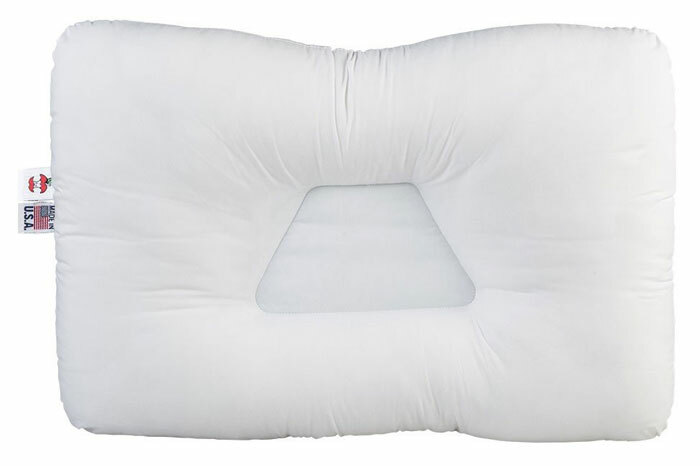 A survey of users indicates that those who sleep on their backs or stomach love this pillow. It is suitable for side sleepers, who may want to adjust the loft of the Coop Home Goods Premium pillow to their personal preference. This is one advantage that this pillow has over most others. The XTreme Comforts memory foam pillow is suitable for all sleeping positions. You can use the inner zipper to add or remove shredded memory foam to adjust its thickness or level of support. Many people prefer shredded foam to solid foam for this reason. Another reason for using it is that shredded foam allows more air circulation than a solid foam does. Find out more about shredded memory foam in our Buyer Guide later. The XTreme Comforts memory foam pillow is similar to the Coop Home Goods Premium pillow above. It is difficult to choose between the two, and the Coop pillow just edged it. The ‘Pros’ below could be extended by adding those above, for the Coop Home Goods pillow. The cover is 56.4% polyester, 43% bamboo rayon and 0.6% lycra (spandex). Like the Coop Home Goods pillow above, This XTreme Comforts pillow is filled with shredded memory foam, the filling of which can be changed to make it softer or harder. Keeps your neck in as near the correct position to avoid neck pain. The shredded memory foam used is of a high enough quality to avoid it losing its properties with extended use. The quality of the shredded memory foam used is such that it reverts your pillow back to its original shape during the day. 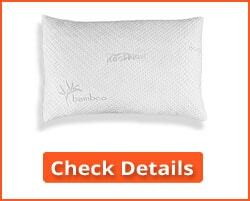 The foam is contained within a high-quality bamboo rayon cover. Hypoallergenic and resistant to dust mites and molds. If you have an allergy, such as hay fever, then this would be an excellent choice of pillow for you. 30-Day money back guarantee: simply ship it back within 30 days and you get your payment refunded. Once again, very few! Some buyers complain about the lack of a zipper to enable the filling to be adjusted. Editor’s Notes: When reading mattress or pillow reviews, you must keep an open mind. Many people have an aversion to certain manufacturers or retailers. Others are unaware of the technical terms used. This memory foam pillow generally gets good reviews, although many people seem unaware of the benefits that shredded foams can offer. Memory foam does not lose its ability to recover from compression just because it is in the form of a thick slab. The XTreme Comforts memory foam pillow is one of the best pillows for neck pain that can buy today! The Tri-Core pillow supports your neck in its natural position. This helps your spine to be correctly oriented, and so help to prevent neck pain. In many cases, switching to the Tri-Core pillow can relieve your back or neck pain completely. Its design may have a lot to do with this. The center of the pillow is a trapezoid shape, and, when combined with the neck roll that is built into it, the neck is properly supported with a significant reduction in neck pain. It can also help to prevent further pain in those already suffering from pain in their neck due to sleeping on the wrong surface or in the wrong position. 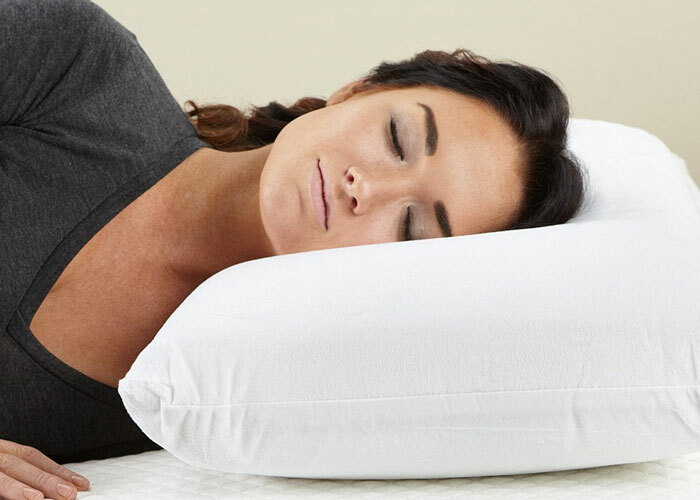 The pillow design helps keep your head and neck in the correct position. Has a built-in neck providing proper support for your neck and correctly spine alignment. It is particularly (but not exclusively) of use to back sleepers. Blended breathable soft cotton cover. 90-Day no-quibble money back guarantee + 1-year warranty against defective workmanship. Some find the trapezoid cradle uncomfortable, particularly when they change sleeping positions during the night. Foam described as high-resilience foam – not as memory foam, although it is stated to spring back to the original position once pressure is removed. Editors Notes: This pillow cradles your head while at the same time supporting your neck. The built-in neck rolls keep your neck supported, rather than it sinking down to the level of a regular pillow. The pillow is also designed with side lobes that are intended to support the neck of side sleepers. The sizing is unusual in that it is not based upon a specific size of mattress. Three sizes are available that between them should suit all users. This is an excellent buy if you suffer neck pain. 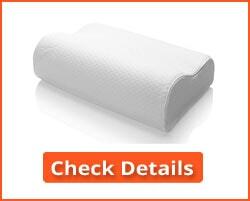 Manufactured by US company Perform Pillow, this is a pillow specifically designed for neck support. The foam and the pillow design were chosen by a chiropractor to support your neck comfortably and help you sleep soundly while keeping your neck correctly aligned with the rest of your spine. It has a rounded pad at one side for your neck to test on, and a thinner pad at the other if you prefer less of a pad below your neck. You can rotate the pillow (not flip) to use either pad according to your needs. It is suitable for back and side sleepers, for whom it provides maximum support for the neck and helps to prevent neck pain, or alleviate it if you already suffer this type of disability. It does not mention stomach sleepers since many chiropractors believe you should not sleep on your stomach. The zippered cover is a silky smooth % polyester and 44% bamboo-based rayon fabric – it is machine washable. 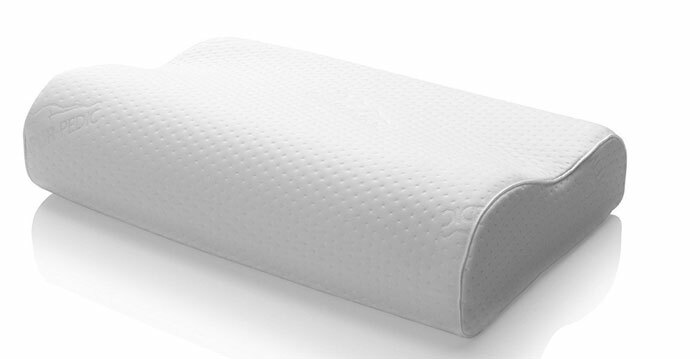 The foam is a breathable 3lb density memory foam that provides support and keeps your head and neck cool at night. Contains no heavy metals (lead, mercury, cadmium and other heavy metals), phthalate plasticizers, formaldehyde, ozone depleters or other toxic chemicals. Choice of thin, medium or thick pillow profiles. You cannot try it out before purchase. Some may find the pillow too small for them, and other that the neck pads are too high. There are three options, but it sees that they cannot all be tested before purchase. Editor’s Notes: This appears to be a well-designed pillow offering excellent neck support. It supports the curve of your neck between your shoulders and your head, and so reduces stress on the cervical portion of your spine. By a supporting your neck, it helps to keep your spine straight for side sleepers (when viewed straight on from front or back). It also helps maintain then natural kyphotic curve of your spine in the cervical (neck) region. Like all pillows that are good for your neck and spine, it helps to keep your neck in its natural shape. The Nature’s Guest cervical support pillow comes with an adjustable 5-inch thick neck roll and a 5.5 inch thick side areas. It provides excellent neck support for back and side sleepers. The pillow is shipped containing the optimum amount of filling which can be adjusted through the zippers each side. A patent is pending on the contoured design of the pillow, which is ideal for back sleepers including those who switch between sleeping on their back and their side. The pillow has a microfiber filling. Chiropractor and orthopedic recommended gusseted edge design, allowing you to easily switch between back and side sleeping for a restful, peaceful sleep. Maintains the correct alignment of neck and spine, and helps reduce neck pain. You can adjust the pillow filling between soft and medium firmness levels. Cotton cover and unique microfiber filling helps promote a good air flow, and helps to keep you cool during the night. Hypoallergenic, so ideal if have a dust or dust mite allergy. Return within 90 days for no-questions full refund. Available only in standard (Queen) size. This may not suit you if you don’t like shaped pillows. Not suitable for those who prefer a soft, fluffy pillow. Editor’s Notes: A drawback with the Nature’s Guest cervical support pillow is that it is available only in one size – Queen. It is recommended by doctors and chiropractors for optimum cervical support. If you suffer from neck pain, or your neck feels stiff when you waken up each morning, then give this a try. It is easy to return the pillow within 90 days if you don’t like the design: the firm accepts returns with no questions asked. The company donates 10% of profits to global humanitarian relief. The Mediflow Water Pillow Is constructed with a top layer of soft material that you can choose yourself. You can choose between down, fiber or memory foam. This is supported by a water layer at the bottom. You can change the firmness of your pillow by adding or removing water until you reach your preferred level of hardness. Fluffing up or restuffing with fiber is not necessary, because the hardness of your pillow is determined by the amount of water in the bottom (support) layer. The soft pillow covering is around 1.5 inches thick, then you can add water to the bottom layer to make it as thick as you want it. The Johns Hopkins school of medicine has clinically tested the Mediflow Waterbase pillow. 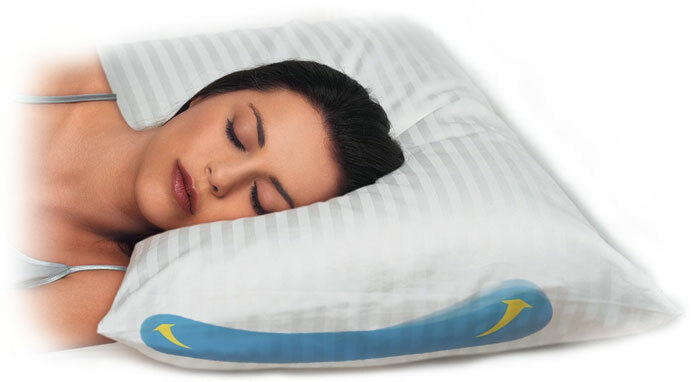 It determined that this pillow is effective in providing a good quality of sleep, and helping to reduce neck pain. The bottom water layer provides support for your head and neck throughout the night, no matter how much you change your sleeping position. The support layer is water, so it cannot be compressed and lose its support properties. The top layer enables you to enjoy a soft sleeping surface without compromising support for your neck. 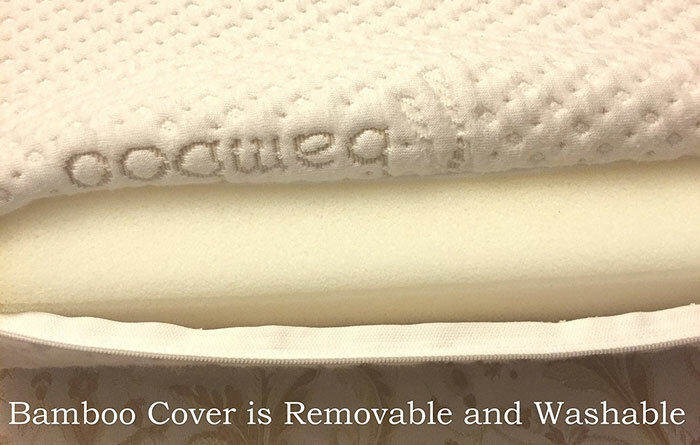 You can fluff up the top layer of the Mediflow water pillow for more comfort, and reduce or increase the water pressure in the bottom part to make it softer or harder to sleep on. You can return it within 30 days for a full refund. Has to be filled with water before use, involving pressing out air pockets. Can be fairly thick when fully filled, although you can partially fill it if you can squeeze the extra air out. Otherwise, this is an excellent cervical pillow. 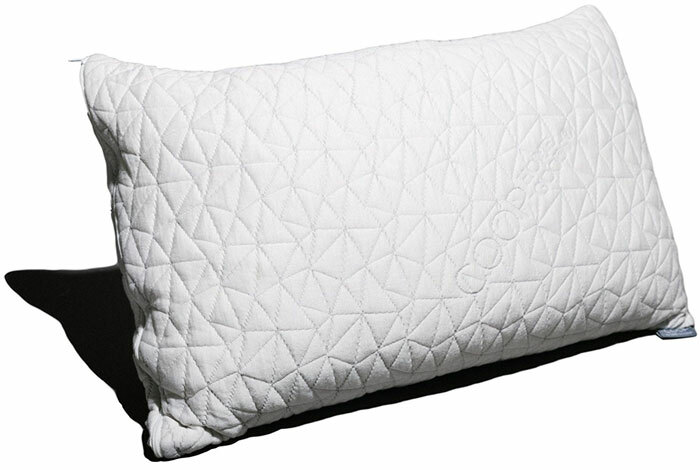 Editor’s Notes: This pillow can be machine washed on a cool or delicate cycle, and tumble dried on a low heat setting. Some buyers may be concerned about old – simply add a few drops of bleach when filling and the problem won’t exist. The Mediflow Waterbase pillow ranks among the best pillows for nick pain since you can adjust its hardness and thickness to your own personal preference. also your shoulders if necessary. As you move your head on the pillow, the memory foam you were lying on returns to its original position, and your head and neck are supported on the new area of pillow. As stated above, you can use the neck contour you prefer best. Memory foam is ideal for head and neck support. It sinks with the heat and pressure of your head, and conforms to their contours. This means that your head and neck are supported as to keep your head, neck and spine in the correct alignment. You wake up feeling refreshed and any neck pain you used to suffer should disappear over time – unless there is an underlying medical reason why it might not. Even if you have need for a cervical pillow, you should find the Sleep Innovations memory foam contour pillow to be comfortable to sleep on. Made in the USA, although the cover is believed to be made in China. Again, very few, although not everybody might be comfortable sleeping on what is fundamentally a bump below their neck. Once you get used to it you can appreciate the benefits it offers. If you don’t like sleeping on this type of mattress there appears to be no way of returning it. There is no ‘trial period’ as with many others. If this is important, then check with the vendor. Editor’s Notes: This pillow has a therapeutic design intended to support your head and neck, and not allow either to sag. By supporting your neck and your head in their correct positions, it can not only help to prevent any future neck pain but also alleviate any pain already there. 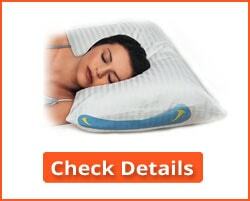 This is not only a cervical pillow, but one of the best pillows for neck pain on the market. 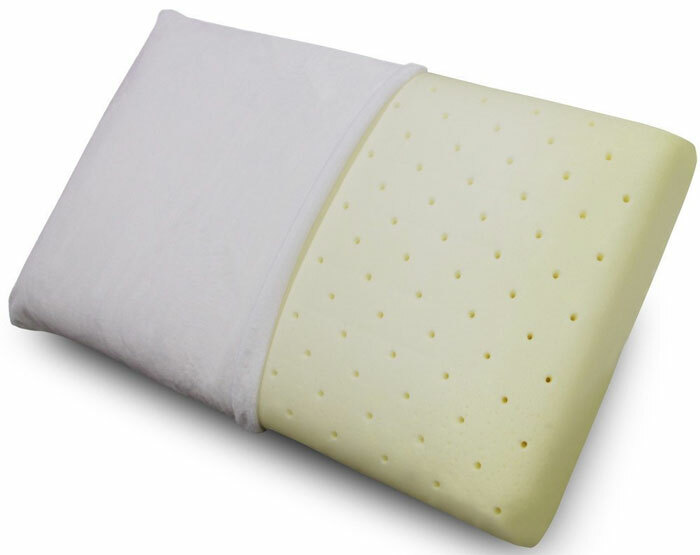 The Classic Brands Conforma is a Cervical pillow that appears to be good for back and side sleepers. It is made using ventilated memory foam: a form of memory foam with ventilation holes running through it. This helps to keep the pillow cool during the night. 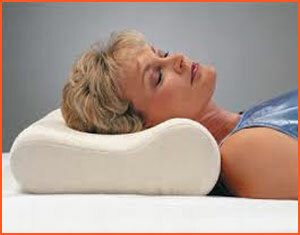 Although ideal for side and back sleepers, it is a good pillow for anyone, whether they need a cervical pillow or not. This pillow is available in Queen (27″ x 16″) and King (33″ x 16″) sizes. The memory foam conforms to the shape of your neck and head and supports both n their natural shape relative to the rest of your spinal column. It helps to reduce or eliminate neck pain. The inbuilt ventilation holes help to wick away heat and keep then pillow cool. The foam is antimicrobial and anti-allergenic. 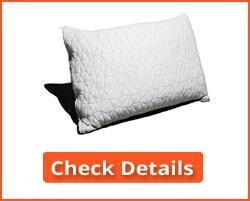 The Classic Brands Conforma pillow is resistant to bacteria, molds, allergens and dust mites. The3 plush velour knit cover is machine washable. Customer service is available seven days a week. Some users find it a bit too thick for them – they find their head is too high up off the bed. Others, however, find it perfect so it seems to be a matter of personal preference. Otherwise, there appears to be few negatives to this orthopedic pillow. Editor’s Notes: This cervical pillow is one of the best pillows for neck pain that is based on memory foam. The ventilation in this memory foam makes it one of the coolest pillows we have tested. If you tend to switch between back and side sleeping, then this would be a good choice. 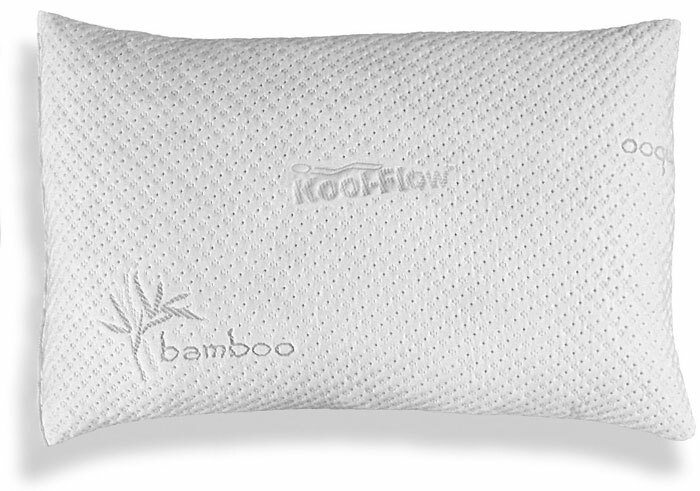 This pillow is similar to the Mediflow Pillow in that it has a water layer beneath the main comfort layer. The water layer offer support, and adjusts its support as your head moves on the pillow – even from side to back to side sleeping. It keeps your head and neck in the correct orientation in relation to the main part of your spine. This is an option to the Mediflow that some prefer – but not all. A top layer of high-resilience and high-memory fiber that recovers rapidly from the pressure of your head and neck while also providing good support to both. The lower water layer proves the main support for the pillow, and adjusts during the night according to the pressure put on it. The ultimate result is a pillow that supports the head and the neck equally, and keeps your spine from head downwards in the correct position. If you suffer neck pain from a poor pillow, then this could resolve that – many that use this pillow report significant relief from neck pain. Similar to the Mediflow pillow: it has to be filled with water before use, and the air removed to avoid ‘sloshing’ of the water. It states no chemical additives needed, although a few drops of bleach is sure to help eliminate mold and bacterial growth in the water bladder. There are no serious negatives to this pillow, and if you like the idea of a water pillow then give it a go. It’s your choice. 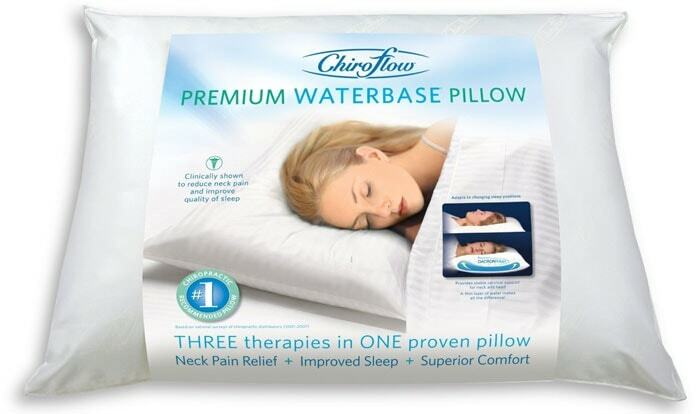 Editor’s Notes: The Chiroflow Premium Waterbase Pillow is not quite a unique Solution to neck pain while sleeping – but not far off it. It is a solution that many might prefer to using memory foams or fiber-filled pillows. You can be sure on one thing – many that have used this type of pillow will never use another. On the other hand, some use it again. Son it’s personal preference. Unfortunately the vendors of such cervical and orthopedic pillows tend not to give “Keep or Return” guarantees. The TEMPUR-Neck Pillow would be expected to get rave reviews, being marketed by Tempur-Pedic. However is not as easy as that – irrespective of the pedigree, it still has to earn the accolade! The design of the pillow is similar to some of those above, with an ergonomic shape to support the head and neck in their correct positions relative to the rest of your spine. As with most ergonomic cervical pillows, it is designed for back and side sleepers. Stomach sleepers are more difficult to accommodate with orthopedic pillows due to the way neck rests in relation to the rest of the spine. Stomach sleepers are best with a thin pillow that keeps their neck as low as possible when sleeping face down. The shape of the pillow was designed by doctors to keep the spine straight from the neck down. Suitable for back or side sleepers. 100% polyester knit removable soft cover that is machine washable. Contoured design to conform to the natural curve of your head, neck and shoulders to ensure a natural shape to your spine. Some issues with smell – Many users gave complained about a chemical odor. Editor’s Notes: TEMPUR-Pedic has a good name in the orthopedic pillow and mattress industry. However, the company may have been focusing its main development into mattresses. The TEMPUR-Neck Pillow is a good cervical pillow by any standards, although some users have been complaining about the chemical smell lately. This may be a personal thing since we have found no such odor in our research. That said, there are many mattresses above which can more than compete with the TEMPUR-Neck Pillow. There is nothing wrong with it, but competitors are rapidly catching up on the big guys and it may not be too long before they surpass them if the big guys fail to respond. When buying a pillow for neck pain it is important to understand what causes it. When viewed from the front or back, your neck and the rest of your spine forms a straight line from top to bottom. When viewed from the side, however, the seven vertebrae that comprise your neck form a curve. When this curve is lost or even reduced, you can feel pain. Many people experience neck pain due to the loss of this natural curve, known as cervical kyphosis. It is fairly common condition caused by bad posture – or by sleeping with your neck in the wrong position in relation to your spine. This issue can often be corrected by changing your pillow to one that helps maintain the correct position of your neck in relation to your head and back. The term ‘cervical pillow’ simply means a pillow that supports your neck – or the vertebrae that make up your neck. The best cervical pillow for neck pain is one that not only supports your neck but also your head. That way, your head, and neck are supported in their correct position relative to your upper spine. Any neck pain you already have should then disappear. This is true whether you lie on your back or your side. It is when you are asleep that your neck can get out of position, and a good cervical pillow is necessary to avoid this. They are also referred to as orthopedic pillows. Memory Foam: A memory foam pillow is one good option. The memory foam softens with the pressure of your head and shoulders, allowing them to sink slightly and be supported, while the curvature of your neck is also supported and maintained. A pillow suitable for this should not be solid hard but should have some give to allow the head to relax into it. Otherwise, the head and shoulders would lie on the pillow and your neck would sink downwards – leading to neck pain. Just what you want to avoid! 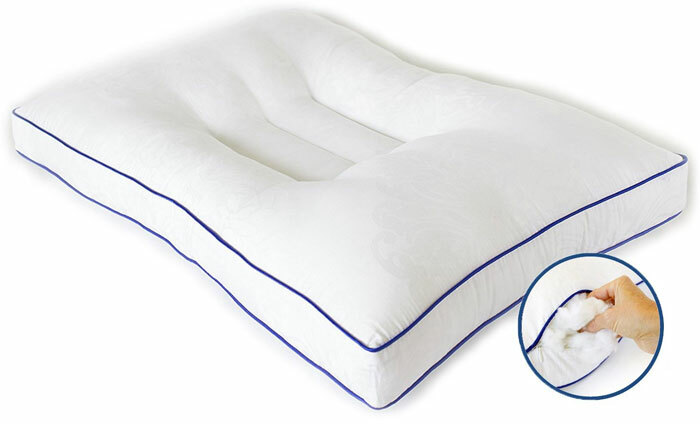 Water Pillows: Other types of orthopedic pillow use water as a support layer. This water layer adjusts to maintain the correct position of your head and neck when you move in bed. Such water pillows are generally designed with a top layer of foam or fiber, with the bottom layer comprising a water-filled bladder. The amount of water used can be adjusted to change the level of hardness and support provided by such cervical pillows. Shredded Foam or Fibers: Yet another type is filled with microfiber or shredded memory foam. You can adjust the filling in some of these pillows to make it harder or softer according to your personal preference. 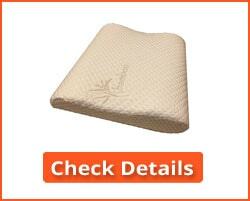 We have included examples of each of these types of the cervical pillow in our review. Shredded memory foam possesses some of the properties of the solid foam. When compressed, the shredded foam portions spring back to their original state when the pressure is released. There is not a lot in deciding on the best pillows for neck pain. The best neck pillow will be one that supports your head and also supports your neck, preventing your neck from sagging and losing its natural curve. This is true whether you lie on your back or your side. Stomach Sleepers: If you sleep on your stomach then an orthopedic pillow will not help you much. This position can strain your neck. Unless you can breathe through the pillow, stomach sleepers have to turn their head to one side, thus rotating their neck to an unnatural position in relation to their spine. Side sleepers are OK because their spine is in the correct position relative to the neck. If you sleep on your stomach, you would likely be better with no pillow, or just a very thin pillow – and placing a pillow under your pelvis would put your back into a more natural position and take pressure off your spine. 1. What is the best pillow for me? I sleep on my side and want to avoid neck pain if I can. Any of the cervical pillows in our list would suit you. However, the best would be one that supports your head, neck and shoulders should the shoulders also lie on the pillow. A memory foam orthopedic pillow would likely be best: one that absorbs the pressure of your head and shoulders while also supporting your neck. The Classic Brands Conforma pillow would possibly suit you best, although the choice is yours. Check out the properties of the 10 pillows in our review. 2. How do I choose the best pillow for neck pain? First of all, you need to need to choose a pillow that suits you. Try to find a cervical pillow that supports your neck and keeps your head flat when lying on your back. A pillow that tilts your head forward could make your neck pai9n worse. If you sleep on your side, your pillow should support your head in line with your neck. If your head is tilted up or down. It could make your neck pain worse. 3. Can my pillow be causing my back pain? It is possible but very doubtful. If you have back pain you need to look at your mattress. If you use a good cervical pillow to keep your neck properly supported, and a good supportive mattress (e.g. memory foam) then you should have no back pain. 4. What if I sleep on an air bed? What is the best pillow for that? 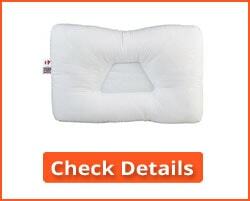 You can use cervical pillows with an air bed. 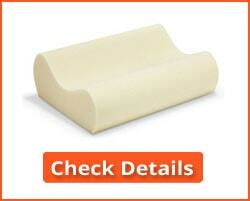 However, even the best orthopedic pillow will struggle to overcome any issues you may come across with some air beds. Keep in mind the need to keep your neck and spine aligned up with each other. The type of bed you have is largely irrelevant. What matters is the way the pillow lines up your head, neck and spine to maintain the natural curve of your neck while you sleep. That why we have published our Best Pillows for Neck Pain Reviews 2019 – to help you choose a pillow to reduce your neck pain – or avoid it altogether. 5. Is all neck pain caused by sleeping on the wrong pillow? No! Avoid using too high a pillow which keeps your neck flexed overnight. If you sleep on your side, then use a pillow that supports your neck. A neck roll is ideal for a side sleeper, but make sure it is comfortable to lie on. Some of our recommendations above offer a neck roll. 6. I sleep on my stomach. What is the best pillow for me? To be honest – no pillow at all! A pillow will force your head back and apply pressure to your neck. If you must sleep on a pillow then a flat thin pillow would be best. Yours is not a natural sleeping position, and your body is not designed for it. If you must sleep on your stomach, then put a pillow under your pelvic area – that will help straighten your spine and help to avoid pain in your back and your neck. 7. I have just discovered that I am pregnant. What is the best sleeping position for me? We recommend you ask your doctor or gynecologist. From our own experience it is best to sleep on your side. Put pillows behind you to stop you falling onto your back (not good for pregnancy) and use a good cervical pillow that tends to keep your head stable. Memory foam might be best, but it is important for you to take the advice of your doctor or gynecologist. Any of the cervical pillows in our review should help you reduce the strain on your neck when you sleep. 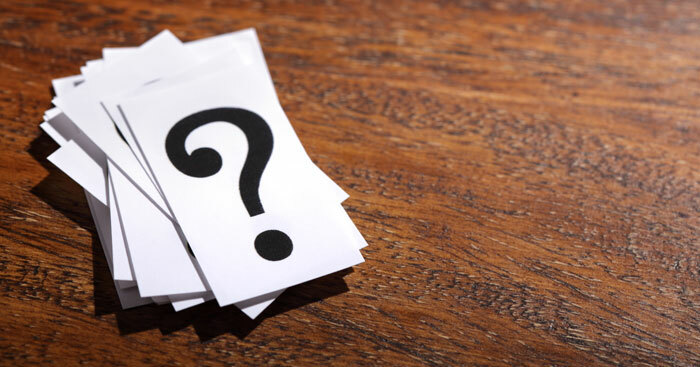 Check out the pros and cons of each one and select the option you like best. As you can see, the best pillows for neck pain come in three major forms: shredded fiber, memory foam, and fiber with a water layer at the bottom. Each of these is designed to help reduce or eliminate neck pain by keeping your neck properly oriented in relation to the rest of your spine.